It removes all colours and it isn’t sun sensitive. On average is needed 4-8 sessions but it varies from person to person. The price of each treatment is slightly higher than laser treatments but the overall cost is usually smaller. Some clients prefer Rejuvi as they find it less painful, therefore if you didn’t get on with laser then Rejuvi is your second choice. We believe that a satisfied customer is the best advert. We want your treatment to be fast and successful, at the best price, so you tell your friends and we get more business! 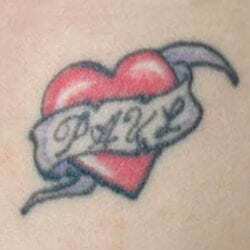 Most of our tattoo removal business is from personal recommendation and that’s the way we like it. The Rejuvi tattoo removal system is a unique method of tattoo ink extraction which is designed to completely remove your tattoo ink pigments from the body. The treatment has been extensively researched, developed and tested for over ten years, and in use worldwide for over five years. The treatment utilises the same methods as having your original tattoo; the removal formula is delivered to the ink using a tattoo or permanent make-up machine. Therefore the treatment can only be performed by a trained tattoo or permanent make-up artist. The extraction cream is specifically designed to blend with and capture the original tattoo ink. The formula then forms into a thicker substance which the skin easily pushes out taking the captured tattoo ink with it. 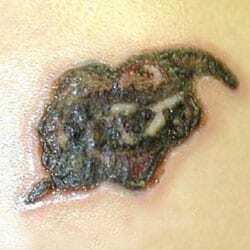 A number of treatments are normally required to completely remove a tattoo. After the treatment course is finished the skin will return to its natural state over a period of months. The benefits of the Rejuvi tattoo removal system over other methods of tattoo removal are numerous. This treatment is substantially less painful than other removal methods and the treatment course and subsequent tattoo removal is much faster and more effective than laser removal options. There is also no need to avoid direct sunlight after treatment, (as is necessary with laser) and aftercare is relatively simple. The Rejuvi tattoo removal system is suitable and effective for both professional or homemade tattoos and permanent make-up on most areas of the body. Sensitive areas near the eyes or areas where high levels of moisture occur may require special aftercare considerations. The treatment is not colour selective (unlike laser) and acts on all colour pigments equally. Tattoos are created by injecting insoluble, micrometer-sized particles of ink into the second (dermal) layer of skin. The cells of the dermis are remarkably stable, so the tattoos ink will last, with minor fading and dispersion, for your entire life! Why Laser removal fails Laser removal relies on using high energy pulses of light to smash the tattoo pigment into smaller particles so it may be absorbed by the body. The wavelengths of the laser light must be varied according to skin color, what color pigments are to be removed, the type of ink used (there are over 120 different inks currently in use), and the depth of the tattoo. Green and yellow are also difficult pigments for the lasers to eliminate due to the fact that they reflect most of the light energy. As all pigments can be traced back to the three primary colours; red, yellow and blue, it becomes clear that remaining pigment elements can be difficult if not impossible for lasers to totally eliminate. Rejuvi tattoo removal is possibly the least painful method currently known for tattoo removal without resorting to use of general or local anesthetic. As the process uses the same tattoo method you have already been through, it is no more painful than that. 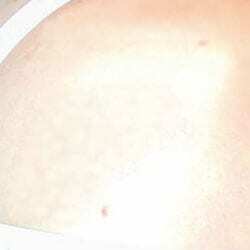 The area is also treated with Painaway; a powerful anesthetic agent to numb the skin prior to treatment. Rejuvi tattoo removal is the fastest non surgical treatment to completely remove a tattoo. Typically a tattoo can be removed in three to four treatments. It takes between six to eight weeks for the treated area to heal sufficiently between treatments. This allows a tattoo to be removed in a matter of months. Laser treatment takes significantly longer. Rejuvi tattoo removal is the most affordable compared to numerous laser treatments. Rejuvi tattoo removal is safe. All surgical methods of tattoo removal are not only extremely painful but will also leave extensive scarring. Incidents of scarring from the Rejuvi tattoo removal treatment are extremely low and are comparable to laser*, however the Rejuvi tattoo removal system will not cause long term skin texture or pigment changes like laser can. Also with Rejuvi tattoo removal you do not have to avoid exposure to direct sunlight after the treatment, unlike laser. Rejuvi tattoo removal is proven. This treatment process has been researched and developed over ten years and in use worldwide for over five years with many clinics in the world now offering the treatment. Some laser clinics have even changed to using this system.